Information Outlook is SLA’s bi-monthly online magazine. 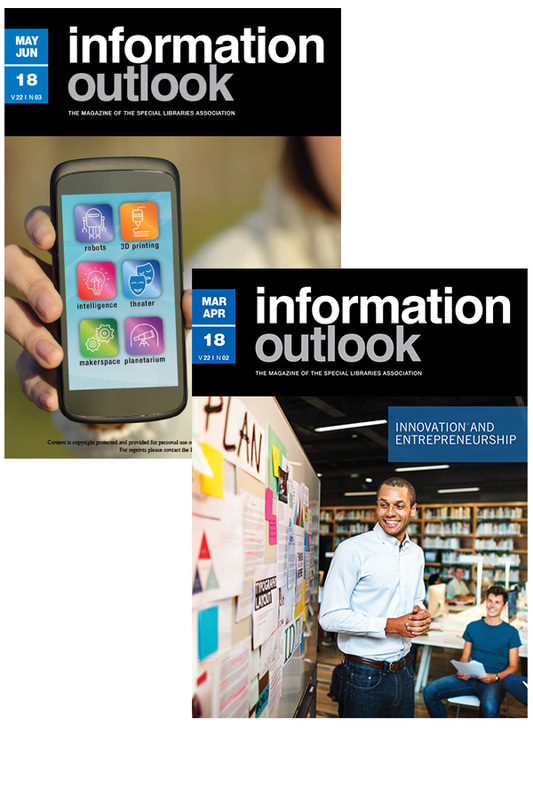 By advertising in Information Outlook, SLA’s digital magazine, you generate brand recognition with SLA’s 4,600-plus member professionals and 250 subscribing institutions. Plus, because readers can access Information Outlook on their smartphone and/or tablet and share content with their favorite social network, your advertising enjoys a broader “reach” across multiple platforms and audiences. Information from advertisers on products, services and solutions that can improve their work! Advertising puts your message front and center to information professionals! Any URLs shown in the ad will link in the digital version. Page size: 8.125" x 10.875"
1/2 Horizontal: 7.125" x 4.625"
1/3 Horizontal: 4.675" x 4.625"
1/3 Vertical: 2.2" x 9.25"